Cyclone Idai has triggered massive floods, displaced thousands in Mozambique, Malawi and Zimbabwe, and killed more than 200 people so far — a toll that could eventually surpass 1,000, Mozambique President Filipe Nyusi said on Monday. The storm has nearly obliterated Mozambique’s fourth largest city, devastating 90 percent of Beira, according to the International Federation of Red Cross and Red Crescent Societies. Heavy rains, expected to continue through Thursday, could further exacerbate flooding and complicate relief efforts. Many aid groups are still assessing the damage and devising logistics to reach the most heavily affected areas, but here are some international and African organizations that are leading relief efforts. Humanity & Inclusion have been working in Mozambique since 1986, helping disable landmines and tackling other issues stemming from the country’s 25-year civil war. The organization has 40 people working on the ground in Mozambique, helping clear roads and giving special attention to people with disabilities. You can read more about their work and donate here. Save the Children is working closely with the Mozambique government and other aid organizations to support children impacted by the disaster. An aerial assessment shows that major flooding is imminent in the town of Buzi, home to approximately 2,500 children. Catholic Relief Services is the international agency of the Catholic Church in the United States. Working with local partners in Mozambique, Malawi and Zimbabwe, Catholic Relief Services are working to provide an initial 4,000 families with immediate aid – food, emergency shelter, water and living supplies. The Association for the Children of Mozambique is a Mozambique-based charity founded by Swiss national Barbara Hoffman.The organization provides support to orphans and runs schools in the country. Joint Aid Management (JAM) is an African-founded organization working and operating in Angola, Mozambique, Rwanda, South Africa, South Sudan, Uganda and Sierra Leone. The UN’s International Disaster Relief System fund would support efforts to provide aid to more than 400,000 people. UNICEF is also on the ground helping children and families. You can make tax-deductible donation to their relief fund here. USA for UNHCR, the UN Refugee Agency, also has its own donation page. The United Nations World Food Programme is distributing food in the city of Beira and surrounding areas, and will stay on the ground to aid recovery as the flooding dwindles. To support their mission, donate here. Gorongosa National Park, a preservation area in central Mozambique, has set up its own emergency food program to provide food and safe water in areas that are harder to reach by the national emergency response crews. Donate and read campaign updates here. Gift of the Givers is an African disaster relief organization that is leading flood response in Malawi. You can contribute to their efforts here. Doctors Without Borders is working to provide medical support and water sanitation in Mozambique, ZImbabwe and Malawi. You can make a general donation to their efforts here. 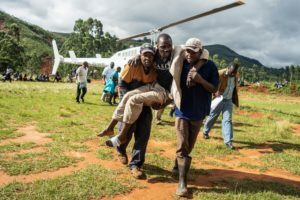 International Medical Corps has been in Zimbabwe since 2009, and they have deployed a response team in Southeastern Africa that is working to access the most devastated areas. CARE, a nonprofit that focuses on women and girls, is providing seeds and livestock. They are also working with other aid organizations to give out tools for water purification, as well as hygiene products and emergency latrines. Oxfam is planning, initially, to assist a half million people with sanitation, health and hygiene, including the distribution of water purification tablets and hygiene kits. The organization also plans an analysis of the way the disaster affects women and girls. You can donate here. The American Jewish Joint Distribution Committee (JDC), the world’s leading Jewish humanitarian assistance organization, is accepting donations for Mozambique relief efforts. World Vision, a global Christian organization, is responding to affected areas in Malawi, Mozambique and Zimbabwe, providing food, water and sanitation supplies. They have also provided household supplies to 3,000 families in Mozambique so far.